…and I did not perish! Mountainash: a project of desire, love, frustration, boredom, longing, and determination. In that order. His first appearance nearly a year ago was met with much enthusiasm, both from me and my readers. I saw a challenge: a Shetland-style shawl, the pattern for which was written in a language completely foreign to me. You became spectators of a true knitting battle: Grumperina versus Mountainash, Determination versus Language Barrier, Persistence versus Boredom. Many more posts followed, and some progress was made… and then summer came. Glorious, beautiful summer! How could I stay indoors and stare at charts when the heat and humidity were so gentle, the sun so radiant? Boredom put her foot down on July 25th. Mountainash and all his paraphernalia went into hibernation for about four months. Once in a while I’d consider knitting a few rows, but the time wasn’t right yet. In December I wrapped up a bunch of projects and had a few weeks of waiting while the yarn for my grandma’s beret and the Komi hat arrived. I didn’t want to start anything new in the meantime, and that’s when I picked up Mountainash again. I didn’t blog about this clandestine spurt of productivity because, frankly, the bits that were left were rather boring. The stitches for the main part kept shrinking, and the border was a serious test of my persistence. Besides, I felt that saying “I’m working on Mountainash” out loud would be a hex and the whole thing would tumble into another four-month hibernation. And now it is done, and you have come for some details. 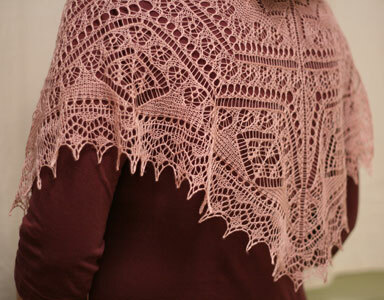 Pattern: Mountainash shawl, New Style of Heirloom Knitting. The book was a most generous gift from Siow Chin. Yarn: Lacey Lamb in color 202. I used about a skein and a third, 80 grams, 1100 yards. At one point this yarn was distributed by Jade Sapphire, but I don’t think they’re carrying it anymore. You can still get it at many shops. Needles: Most of the shawl was knit using 2.75 mm (US 2) Inox Express circs, and most of the border, 2.75 mm dpns . Smaller needles were specified for the center top of the shawl, so I used a 2.50 mm KnitPicks circ and 2.50 mm Inox aluminum dpns. Finished dimensions: This one came out a monster: 74″ across the top, 35″ from top edge to point. This is where I would typically list my modifications. I’m sure the difficulty of this task doesn’t escape you, considering I only have hints and guesses about the actual instructions. I know for sure that I assembled Mountainash in a completely different order than the pattern specifies. And that’s about all I know. This inadvertent change had me most worried about attaching the border. Fortunately, I had completed my Melon Shawl prior to tackling the border of Mountainash, and had no hesitations about “afterthought border attachment” when the time came. One of the most special things about this project was the yarn I used, Lacey Lamb. This 3-ply cobweb weight 100% lambswool is the definition of sproingy. The knit fabric felt like a very fine sponge, trapping lots of air between all those plies and strands. The shawl was minuscule before blocking: 47″ across the top, 22″ to the point. Enough stretch was stored in the fiber to nearly double it in size during blocking! The only downside I noted while working with this yarn is that it split somewhat easily – nothing a good pair of knitting needles can’t circumvent. It doesn’t hurt that the charts were virtually error-free. There was the one mistake in the beginning, and I found another simple one in row 237 of the main triangle: that k3tog should be a k4tog. But considering there’s a total of 249 rows in that main part, by the time you get to #237, I think you’d be able to figure it out on your own :). I am in love. It’s gorgeous. Congratulations. Congratulations! Mountainash is be-yoo-ful! That photo of you behind the shawl is even more spectacular! To think that you were able to achieve this feat without oxygen is beyond me! The best part is that you don’t have to descend now that you’ve reached the summit. BTW: Nice to know that I’m not the only one up at this ungodly hour! Is the air thinner at the top of Mountainash? It’s simply beautiful! Thank you for posting so many pictures! Congratulations on your accomplishment. You overcame much to complete this lovely shawl. Thank you for sharing the Japanese links. Just amazing! Congratulations for finishing! That’s stunning, and the shot of you behind the shawl is exquisite! I can’t think of more to say at this hour (which is funny, because in grad school, your late night posts were my study breaks, but now that I’m a member of the workforce, well, I shouldn’t be up now), but thanks for sharing! Holy smoke. Boundless admiration from me – both for the exquisite shawl and for your grit is finishing it! Maybe this will inspire me to pick up my poor neglected Lotus Blossom again. WOW! There are no words. It is just lovely. Gorgeous! Great choice of color, too. I am always inspired to improve in my knitting when I see such a knitted masterpiece. Congratulations! Oh, very amazing and perfect. And the pink makes it more elegant. That’s amazing! Good on you for persevering, it totally paid off. The shawl is just gorgeous! Divine!!!! The shawl is an absolute work of art!! Eleventy dozen others will say this, too, but your shawl is magnificent! I’m currently struggling with sock weight yarn on US1s, and you’re doing an entire shawl in spider-web on US2s. Glorious! So pretty! You definitely have something to be proud of! Beautiful, beautiful, beautiful shawl. Absolutely stunning. 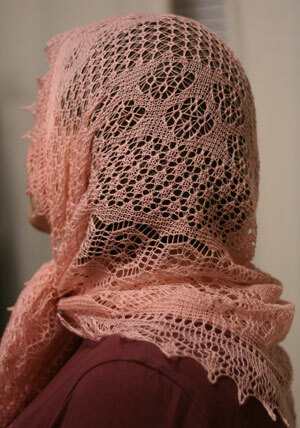 How, when, and with what do you wear your lace shawls? I’m afraid most of the shawls I’m planning to knit will rest in peace in my wardrobe waiting for some special occasion that rarely or never comes, and that is a sad destiny for something so pretty and time-consuming. Beautiful and inspiring – I want to cast on for a shawl now. very very beautiful, well done for your persistance. I lurk at your blog all the time, but I finally have to comment because this shawl is FREAKIN’ AWESOME!!! I can’t believe you haven’t been knitting your whole life. And congrats on being in “Interweave”–my fave knit mag ever. GREAT work! THAT is an heirloom. My goodness, it is a stunningly beautiful, incredible piece of work. You must be so proud of your self. I’m happy for you that you got past the boredom to finish it. What a beauty ! It’s a real gift you make showing us such a gorgeous work. Thanks a lot. I’m not worthy to even read this blog, I don’t think. How gorgeous! Congratulations on reaching the summit. Thanks for sharing the finished product. And, as always, I’m in awe of your persistence and talent. Such a beautiful end to a long project! Congrats! Oh Kathy. It’s utterly stunning. Congratulations on your accomplishment. All I can say is wow… it is so stunning that I can’t honestly find words to describe it. It also makes me itchy to cast on for my first lace shawl! Its absolutely gorgeous! I was wondering if you were going to resurrect it. Congrats on finishing the shawl, its a great color for you too. That is quite an accomplishment. I would say you reached the summit of Everest! So beautiful! What an accomplishment. You should be so proud of yourself. This is awesome! I’m so happy that you reached the summit and has it been almost one year already? Unbelievable. Wow! That is gorgeous! I worship you for your stamina! Delurking to join in singing the praises of YOU and this shawl! It is exquisite, as befits the high level of difficulty. It’s quite possible, isn’t it, that you are the only knitter in the U.S. to have made this shawl – very exciting! I think that is the most exquisite shawl I have seen! So delicate and beautiful… I can’t stop going back to take “one more look” at the patterning. A spectacular ending to your long journey. Enjoy! wow. haha love that mountain pic! it’s stunning. you have a determination that i hope to gain one day! Simply stunning. I have no words beyond those. Breath taking… I am in awe! beeyooootiful! i love the first and third photo at the top. victory is yours! I just returned from a school meeting where they said they try to help the kids improve their self-esteem by giving them hard things to do and letting the kids struggle and then succeed. You, my dear, must be full of high self-esteem right now! I’m so glad that you were able to decipher the Japanese pattern. I really think that people would find it really rewarding to try a Japanese knitting or sewing pattern – they are pretty logical and not very wordy. Lots of good pictures and charts. Great job!!!! oooh, you make me pee! Simply fabulous. Knit on, honey! It’s spectacular, and I love the picture of your silhouette through the shawl. What a masterpiece. *gasp*..wow! Now I feel somewhat inferior and really embarrassed that I had ever screwed up on basketweave stitches. Wow! Wow! Wow! Well worth the effort! It’s amazing! Really lovely. I love the babuska look. My grandma would approve, as she was always trying to get a babuska on me…never one so beautiful though. Exquisite! I enjoyed your picture of it on the mountaintop. This is my first post here, I found your blog through a knitting class I took last november at Cooper Union here in New York. Combination knitting was one of the first issues that arose, and our teacher, Lisa Daehlin, recommended your site. I’ve been addicted ever since. Your blog is entertaining and informative. Also, you have good taste! I’ve bought two books (knitting nature and scarf style) that I originally saw here. I enjoyed the suspense that built up yesterday in the comments over whether this was actually Mountainash. Victory! Rock on Grumperina! And thanks for all the inspiration. Wow. I agree with another comment; that is definitely and heirloom piece. Just beautiful! The photos are fabulous too! It’s gorgeous! As always, I must bow before your perseverence. I hope this hasn’t turned you off Japanese patterns for life, though! Some of them are really wonderful. Have you ever checked out the Japanese handknitting magazine, Diakeito? I read enough Japanese to get by, so if you ever feel like tackling another pattern and get stuck, I’d be happy to help. It’s amazing. I particularly love the mountainash “flag” at the top of your mountain! Brava! What can I say other than AMAZING!! Utterly amazing…both the knitter and the knitted. Congratulations!!! It is so beautiful! It’s finished! Great googly moogly! Kathy, absolutely beautiful work as usual. Persistence paid off big time! That is simply beautiful! I love knitting lace and that is gorgeous! It’s gorgeous, inspiring, intimidating. Cudos to you for starting it and being brave enough to set it aside and then actually pick it back up months later and complete it. Wow, that is just crazy. As in, crazy delicious! 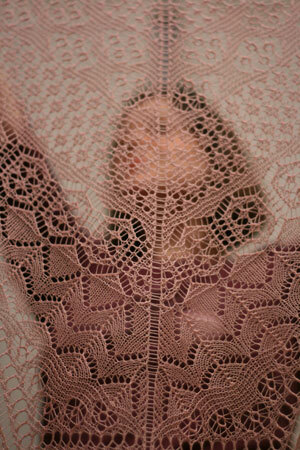 I’m inspired to pick up my lace scarf that has been lying fallow since summertime. it’s absolutely stunning! i’m so glad that you finished it! Your skill and talent never fails to inspire me. I also LOVE Lacey Lamb and this a one of the most beautiful things I’ve seen made with it. And Yes, Jade Sapphire still distributes it (they even have new colors this year!) so any shop who carries Jade Sapphire should be able to get it. Well done, lovely. Beautiful! You are inspiring me to complete my (very simple by comparisson) Irish Diamond Shawl. Another beauty. I’m happy that you finally finished the shawl. I was thinking about it a couple of week ago, believe it or not. I am hypnotized. Which, thankfully, is not the same as springing into action. In my 40 some years, I have only knit a handful of shawls and none of them near to the musical perfection of the mountain ash. How could I ever attempt to climb in your footsteps? holy cow, that is freakin’ amazing! Lovely. It gives me inspiration to continue with my shawl which is not complicated but I am a slow lace knitter. Absolutely incredible !!! The photos are beautifully done. Wow, just wow. Enjoy wearing it! Don’t know if anyone else mentioned this, but Jade Sapphire IS still carrying and distributing Lacey Lamb. At TNNA they had just got new ball bands for it so that it wasn’t in Chinese, but they just don’t have it up on their website. I can’t believe it! You revived Mountainash! And aren’t you glad you did? It’s utterly gorgeous, googly-mooglies and all! Everything that’s already been said. With a cherry on top and sprinkles! I especially love the shot of you obscured by Mountain Ash. Despite the trials and tribulations, you come shining through. You must be so proud! It looks wonderful. I’m (almost) speechless. That’s one of the most beautiful knitterly things I’ve seen of late. Congratulations on a job superbly done. 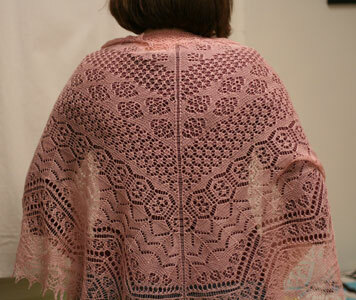 Congratulations, what a beautiful shawl, it has inspired me to buy a lace book now. Oh my. That’s one of the most amazing knitting accomplishments I’ve ever seen in blogland. Totally gorgeous. Enjoy wearing it and be proud, proud, proud! OMG! this is the most beautiful shawl I ever seen. 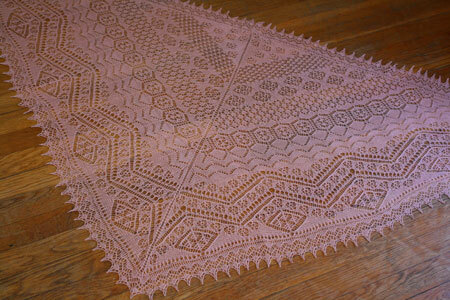 Congratulations on finishing, that is one lovely, lovely lace shawl, and I love the color. I wish I had the nerve to try lace, I have a few lace books, but I have not gotten up the nerve yet. Absolutely gorgeous! I stand in awe of your magnificience!! Totally and utterly beautiful and I admire your skill and dedication in getting it finished. There is no way I could knit something like that – I simply do not have the patience. A beautiful opus. What’s next? I am in awe. Truly spectacular work. Not sure what else to say but BEAUTIFUL and I know that doesn’t cover it. You should be so proud of yourself for accomplishing such a feat! I can only join in with what everyone else has already said: beautiful, gorgeous, wow, amazing! I am in awe! Absolutely Beautiful! Thanks for the yarn review. We just got lacey lamb in at the yarn shop where I work, in many wonderful (and atrocious) colors, and I was wondering how it knit up. Sproing-y yarn is wonderful to work with! As you’ve heard, it’s beautiful! What I would like to suggest is..enter it in your State Fair. Seriously. Lace like that deserves a Blue Ribbon. Seriously. I hope we will be able to see the handsome Mountainash soon. Maybe on the 22nd if you can both wing it? Oh my golly gosh… I bow down at your feet oh knitting guru! ;-)! It’s truly beautiful, Kathy. Enjoy your accomplishment! WOW. And again WOW. I am bowled over. It’s stunning, and the endurance and smarts it took to create it are even more so. Wow. You are *such* a rock star. HAHAHA!! 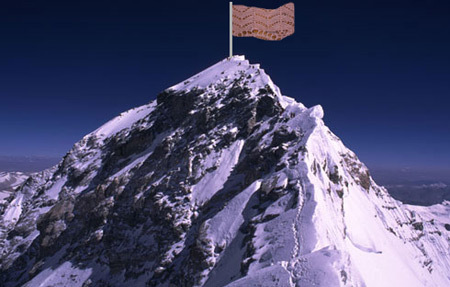 I am so glad you actually posted the image of the shawl as a flag on the mountaintop. That’s great! That said, this project is quite the accomplishment. You did a beautiful job! Mountainash is just amazing. Love it! P.S. – I especially love the photo where you are holding Mountainash in front of you. Artfully done! Fantastic accomplishment! Congratulations, it’s beautiful! congrats on this epic accomplishment! It’s a beauty. luv the photo too (grin) – it is so fitting for this completion. I’m sitting here with my first little bit of lace in my hand and dreaming of a day when I’ll be as good at it as you are. Wow. Just beautiful. I’m not worthy to even gaze upon the FO pix… whew! Amazing! — And I bet you didn’t even leave your empty oxygen bottles lying all over the summit! The before and after photos are astonishing! What a fun blocking job. Congratulations on the beautiful work and the determination to see it through. This is one of the best things about knitting. We can build ourselves up with confidence when we manage such beautiful results. It’s beautiful! My shawl is on vacation. There is hope for me yet. Breathtaking doesn’t really begin to do it, does it? You put my Japanese knitting to shame. I can barely start the swatch. To say I’m impressed would be the understatement of the century. Brava! Brava! Congrats on the project completion! What an accomplishment, you must feel so good! Your shawl leaves me speechless! I can not even imagine making this. I am in awe!!! I saw the lacey lamb at my LYS, and saw how thin it is. I’ve flossed with stuff thicker than that!